Tom Olsavsky spent 17 years as a club engineer at TaylorMade-adidas Golf. 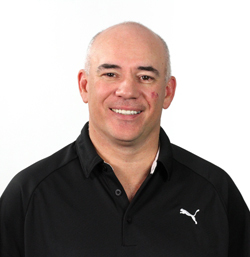 Olsavsky was the company’s senior director of product creation from 2006 until October 2013 when he signed on as vice president of research and development at Cobra Puma Golf where he in charge of an R&D department of approximately 30 club engineers and designers. I recently caught up with Olsavsky to talk about his past and the future for Cobra. GEG: You were at TaylorMade for 17 years. What prompted the move to Cobra? TO: It’s a step on a career path. I could have kept doing the same thing at TaylorMade but this is a great opportunity for me. I get to run a larger group here rather than metal woods. And it’s a great group, with some of the people I’ve previously worked with at Titleist and TaylorMade. So it was the right time and the right place for me. GEG: What’s the biggest difference you’ve seen between Cobra and TaylorMade? TO: When I started at TaylorMade, we were a $200 million company scratching and clawing to take market share from Callaway, which was by far the most dominant (equipment) company at that time. We’re really a growing company. If you remember the history, Puma bought Cobra from the Acushnet Company in 2010, so we’re really kind of a young, four-year company with a start-up mentality. GEG: It’s still early, but are you happy with the year thus far? TO: Things have been going well so far this year. We’re fourth in metal woods share according to the last count, so we have a little momentum. The Bio Cell and Baffler XL lines are doing well in the Sunbelt. Obviously most of the rest of the country hasn’t had good weather yet. GEG: Can you describe a bit about the Bio Cell and Baffler XL lines? TO: Baffler XL probably is the best set on the market for high handicap players who deal with a slice. The drivers, fairways and hybrids each are offset. Bio Cell is kind of a takeoff of our Amp Cell line, but we’ve added more colors, including black this year. But the biggest difference is the structure. We go above and beyond what most companies do. We work hard at thinning out the face and crown and hosel – those areas where you don’t need weight. We have the CG (center of gravity) as low as anybody else, but we don’t put it all the way forward like some companies. We put it a little farther back because we think that’s the best balance in terms of performance and forgiveness. Some companies are not as diligent about taking our every gram of weight in the structure that you can. That’s one of the things I’m really pleased with at Cobra. GEG: Any big surprise or surprises you have learned about Cobra that you didn’t know about the company while you were at TaylorMade? TO: One of the things I found out here is that there is a great passion for designing golf clubs. It’s a really good group that’s excited about the brand and the future. Probably our biggest challenge is just awareness. We believe that if you hit our products and put them in your top three or four in your consideration set, we’re going to win on performance. The different colors bring fun to golf, but once we start getting into performance comparisons, I think we’re going to do very well. GEG: When you joined Cobra, did company President Bob Philion give you any kind of mandate in terms of expectations? TO: I was hired for my experience and proven record, so there was no mandate from Bob. He told me, ‘We’re going to grow the business and have fun while we’re doing it.’ That’s what I signed up for. We know the size of the business and we know what the markets are. We have to go get it. We don’t feel like we have to overreact (to product cycles). We don’t see the game for us. We have a little bit more freedom in our schedule. We don’t have to pull the trigger as fast as some other companies. We have some really exciting concepts are we’re working hard to make them work.